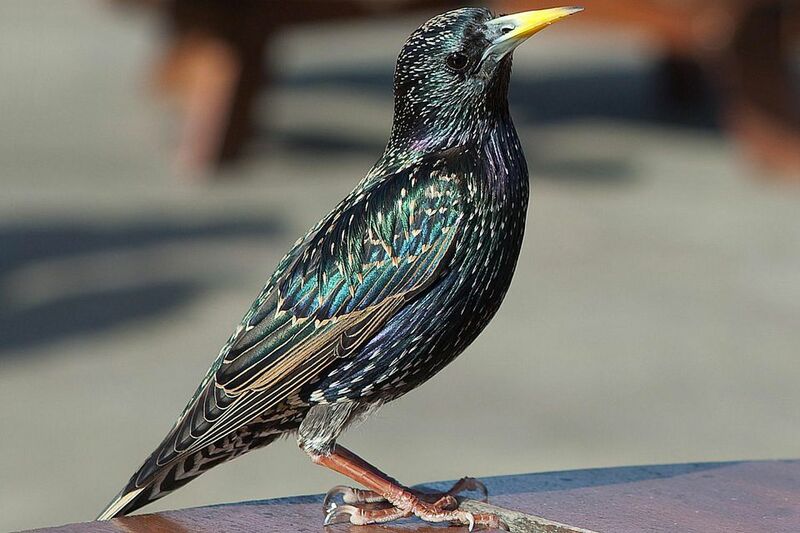 Adaptable and resourceful, the European starling is a common bird worldwide and is one of the most familiar birds in the Sturnidae family, which includes more than 120 different starling species. Native to Eurasia, the species has been so successfully introduced around the world that it is considered an invasive bird in many areas, including North America. This fact sheet can help birders learn more about these widespread birds, including what makes them special and unique. These are stocky birds with short, stubby tails. Males and females are identical with allover black plumage highlighted with an iridescent green and purple gloss on the head, back, nape, flanks, and chest. After molting in late summer, these birds have buff, whitish, or brownish tips to their feathers, giving them a heavily spotted look, though the spots wear off by spring. The wings and tail are dark and edged with buff. The legs and feet are red, and the bill is bright yellow during the breeding season. Winter plumage is duller overall without the iridescent gloss, and the legs and feet are darker. In winter, these starlings have a dull gray-black bill. Juveniles are sooty gray all over, with slightly darker lores and a paler throat. Young birds have black legs and feet and a dark bill. These are noisy birds with a wide variety of loud, demanding calls. Typical calls include whistles, chatters, rattles, chips, and trills, and they can also imitate numerous other bird species and non-bird sounds, though they are not exclusively mimics. Juvenile birds are especially loud when begging in the nest or shortly after fledging, and a flock of either juveniles or adults can make an overwhelming cacophony. The European starling's native habitat includes a year-round range in western Europe and around the Caspian Sea that expands to Scandinavia and western Russia in the summer and the Iberian Peninsula, Middle East, and northern Africa in the winter. These birds have been introduced in many regions worldwide, including South Africa, Australia, and New Zealand. In North America, European starlings are found year-round throughout the continental United States, northern Mexico, and southern Canada. Regardless of where the birds are found, they prefer open habitats such as plains, agricultural fields, and open woodlands. In urban and suburban areas they are frequently found in yards and parks. In their European range, these starlings migrate further north and west during the summer breeding season, and extend further south during the winter. The large central portion of their range, however, is occupied year-round and many starlings do not migrate. In North America, these birds extend slightly further south into Mexico during the winter, but otherwise do not migrate. European starlings are tenacious, energetic birds that can be aggressive when feeding or nesting. During the breeding season they are generally solitary or found in pairs, but in the fall and winter, they will form large roosting flocks that may number up to one million birds or more. These large flocks can be primarily starlings or may be mixed with different blackbird species. These starlings are omnivorous, opportunistic feeders. They eat a wide range of insects, fruit, grain, suet, and seeds, and will also sample kitchen scraps and other available foods, including carrion. This broad diet allows these birds to stay in many areas throughout the year, even as food sources change. While feeding, these birds forage on the open ground, prodding into short grass and soil with their bills to seek out insects and grain as they walk around, with occasional hops in their gait. They have been known to raid other birds and will readily steal from one another. These are generally monogamous birds that aggressively claim nesting cavities from other species, including woodpeckers, chickadees, and bluebirds. They will also nest in unusual places, such as inside dryer or attic vents, loose siding, open pipes, or other nooks. Occasional polygamy is noted in some males. A mated pair of common starlings will produce 2-3 broods of 5-8 pale blue or greenish oval-shaped eggs each during the breeding season. Both parents incubate the eggs for 12-14 days, and both parents will feed the helpless, naked chicks for an additional 19-21 days after hatching. After leaving the nest, the juvenile birds will follow their parents for another one or two weeks begging and demanding food. These birds are not considered threatened or endangered, though in some areas of their native range, their populations are declining drastically. In other areas, however, populations are rising, leading ornithologists to believe the overall range of the species may be shifting somewhat, rather than simple population changes. In areas where these birds are considered invasive, they are not often protected and may be subject to culling or persecution. Common starlings are easily attracted to feeders with peanut butter, suet, and bread scraps, and they will also visit platform and hopper feeders for seed and grain. Because these birds can bring large flocks with voracious appetites to a yard, however, many birders prefer to discourage their visits. Using feeders with cages to exclude larger birds and cleaning up seed spilled on the ground can minimize European starling intrusions and make room for a more diverse flock of feathered visitors. European starlings are not difficult to find, and are easily seen in urban and suburban areas. They are often found perched on wires or foraging in grassy medians, even on busy roads. They are also seen on athletic fields, in parks, or anywhere there may be spilled food or scraps, including near dumpsters and trash disposal areas. While the European starling may be the most familiar starling, but there are other outstanding starlings that birders should get to know, such as the greater blue-eared starling. To discover even more amazing birds, check out all our detailed bird profiles!